A safe, efficient construction project usually conjures up strategically-placed orange cones and other road barricades. Indispensable, no doubt. But hardly the final word on strategic thinking and planning. For that, roadway safety requires the brainpower and energies of highly-trained, extremely competent road traffic safety personnel. It is the good fortune of Roadway Construction Service to be well-stocked in this all-important asset. Nowhere on earth, or perhaps beyond, will you find a more skilled and experienced team of dedicated experts looking out for the public at large. Their skill is evident at every level. Consider the most basic piece of hardware ever to protect a municipal roadway – cones. A simple, glowing piece of plastic is what most people see. We, however, regard these as the result of major traffic control planning. If there is any doubt about this, look at the great lengths we go to just carry out effective road barricade installation and management. Cones, and every other barrier, are set in place according to a well-defined, thoroughly-analyzed strategy. Any road barrier strategy covers quite a stretch of territory. Navigating this terrain demands an expert team of road traffic safety personnel capable of envisioning the big picture of possibilities and variables. Their goal is an air-tight, safety-assured implementation plan. But this plan is only the first stage on the road to implementation — a stepping stone to ultimate prize — final approval and the granting of permits by municipal officials and decision-makers. City traffic control permitting is both an art and science, requiring in-depth knowledge and a deft touch with just the right amount of intuitive imagination. The planners on the Roadway Construction Service team are fortified with all these qualities, which enables them to meet the compliance requirements of those in authority. This includes an extensive array of official authorizations, including tough-to-get encroachment permits. With our team carrying the torch, quick, timely decisions are a consistent result. As for field action, our traffic control flaggers carry the ball once the implementation plan is signed, sealed, and delivered. 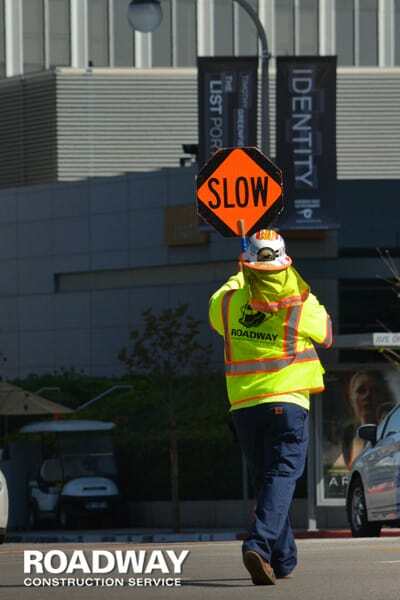 The name flaggers barely does justice to the expertise exhibited by this segment of our road traffic safety personnel. Each is a consummate professional, thoroughly trained and qualified by the industry’s most prestigious credentials. In fact, our entire team is comprised of certified and licensed personnel boasting a full range of credentials, including certifications from OSHA and ATSSA . Thanks to their qualifications, our personnel are well-prepared to provide effective solutions for every situation, including emergency road traffic control services. And don’t worry about availability. This stellar team is ready and on call 24/7 every day of the year, including holidays. Would you like to learn more about the advantages offered by our expert road traffic safety personnel? Reach out to Roadway Construction Service any time. We’ll be happy to provide additional information and answers to all your questions.